Meyer Werft delivered the 168,666-ton Ovation of the Seas to Royal Caribbean at Bremerhaven today, a few days earlier than planned. 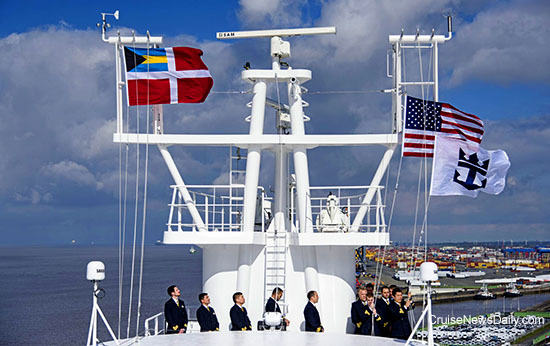 Royal Caribbean Chairman and CEO Richard Fain and Meyer Werft Managing Partner Bernard Meyer signed the paperwork aboard the ship as the flags were changed on the ship’s mast while the officers looked on. 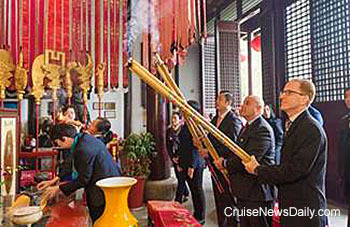 Details appeared in the April 8 edition of Cruise News Daily. The flags on Ovation are changed when the paperwork is completed. On the eve of the inaugural of the Fathom brand, and only a month away from the first of their cruises to Cuba, a small detail in the approval of the program by the Cuban government has come to light, that puts Fathom (and Carnival Corp) in an uncomfortable and politically incorrect position. 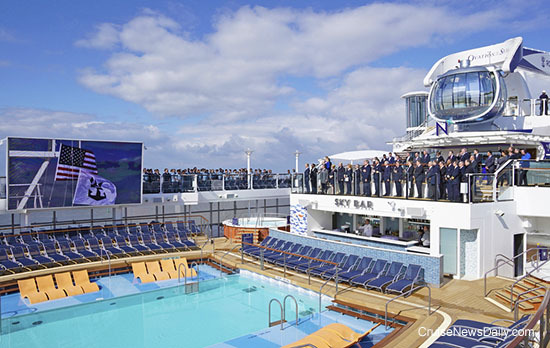 The complete story appeared in the April 8 edition of Cruise News Daily. A Model Apartment or a Living Billboard? When a developer is working on a building of ultra-high end apartment-condominiums, they will often rent a large showcase space in a building with a location with lots of traffic and build a model apartment within it, a complete replica of portions of the apartments in the new building complete with the types of finishes it will have, and the type of furniture the potential buyers would use. The idea is so buyers can get completely immersed in the apartment and experience the feeling of being there, touching the high end finishes, so they can easily imagine themselves living there. Expensive? Sure, but developers who make that investment say they can sell out their building many times faster (at asking prices) than if they just print a slick brochure. Crystal is taking the unusual step of doing the same thing right in downtown Miami. Of course, they have the unusual product to sell. The 100,000-ton luxury ships they have on order will have a top deck of Crystal Residences, apartments which will run from 600 square feet up to 4,000. The 48 homes on each ship will have their own reception area and private restaurant. And this is how you sell multi-million-dollar residences like that. At the same time, the facility will showcase the growing portfolio of Crystal products and lifestyle one can expect on Crystal. Royal Caribbean International beginning to offer multi-day shore excursions. Carnival Foundation awarding 15 South Florida high school students four-year college scholarships. The program mentors them before they reach high school and all the way through high school. Over the past 14 yeas, Carnival has provided more than $2.3 million to purchase scholarships for 105 students. Fincantieri delivered Koningsdam to Holland America Line last week, and the Italian builder provides a unique perspective on the ship in the video below. This may sound like a news item that is being repeated, but it is a brand-new story. MSC Cruises has ordered yet another new class of ship from STX France. This means MSC now has on order three (yes, three) new classes of ships, which if all the options are exercised, will total eleven futuristic new ships to be delivered by 2026. It probably also makes MSC the only line to ever have three classes of ships on order at the same time, none of which have even entered service. The letter of intent signed today provides for two firm orders and two options for ships which will be known as the World Class. Crystal's 100,000-ton newbuild that was supposed to be delivered in the fall of 2018 is being delayed until 2019. Crystal will still take delivery of their 25,000-ton expedition ship in 2018. Fincantieri laid the keel for the fourth ship in the Viking Ocean series at their Ancona yard today. It will be called Viking Sun and be delivered in 2017. Carnival Victory achieved a perfect score on its latest US public heath inspection. When Royal Caribbean’s Harmony of the Seas takes to the ocean, it will have the ultimate waterslide at sea - The Ultimate Abyss. The only waterslide that drops you almost ten stories. You’ve heard about it, and it has been on the drawing boards for some time. Now you can meet the people who are creating it and see what all the buzz is about in the video from Royal Caribbean below. Details appeared in the April 6 edition of Cruise News Daily. 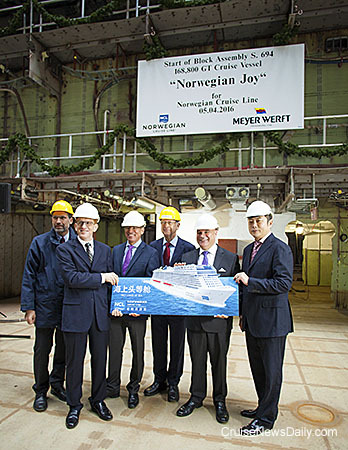 Meyer Werft laid the keel today at their Papenburg (Germany) facility for Norwegian Joy, the ship Norwegian Cruise Line is dedicating to being based year round in China for the local market. The 750-ton block, designated block 45, was brought into the dry dock in Meyer’s covered building dock several days ago. It is one of about 80 blocks (pre-built pieces) that will make up the ship. This one is part of the engine room. Today, an 800-ton crane lifted it into place in the dry dock. Executives from Norwegian Cruise Line and Meyer Werft gather in front of the massive block 45. 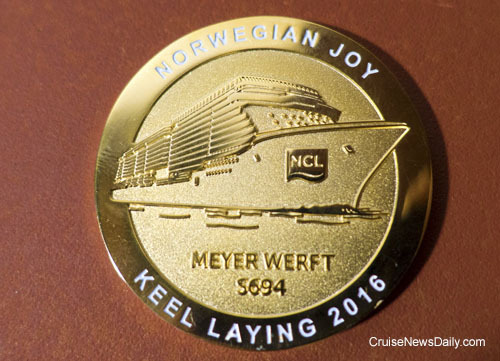 Photos courtesy of Meyer Werft and Norwegian Cruise Line. All rights reserved. May not be copied or used without express permission. 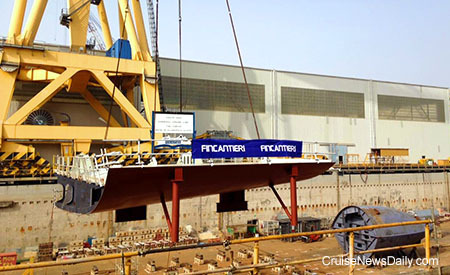 Fincantieri laying the keel Tuesday for the second Carnival Vista-class ship at their Marghera yard. The unnamed ship will be delivered in the spring of 2018. Meyer Werft plans to deliver Ovation of the Seas early (this Friday) after a propeller change. Big Brother Big Sister opened a new facility in Miami yesterday thanks to a $5 million donation from Carnival Corp. Details were in the April 5 edition of Cruise News Daily. The first block of Carnival Vista 2 is put in place at Fincantieri's Marghera yard. MIAMI – April 5, 2016 – Celebrity Cruises has named Peter Giorgi Chief Marketing Officer. Giorgi will oversee the bold new “Modern Luxury Lives Here” brand campaign, as well as all aspects of the cruise line’s global marketing platforms, brand strategy and development, digital marketing, social media, research, loyalty, direct marketing and advertising. Giorgi will join Celebrity on April 15, 2016, and will report to Lisa Lutoff-Perlo, President and CEO of Celebrity Cruises. Giorgi most recently served as Head of Global Advertising for Airbnb, where he led the development and execution of creative marketing platforms that contributed to the growth of one of the world’s most disruptive and newsworthy brands. His work at Airbnb included launching community-driven social campaigns, global film and digital campaigns, anthemic cultural campaigns and award-winning digital content. Giorgi also spent eight years at Crispin Porter + Bogusky, one of the world’s most awarded advertising agencies, most recently as VP Account Director. While at the agency, he worked on brands including Volkswagen, Jose Cuervo and vitaminwater. Giorgi received a Bachelor of Science from the University of Toronto, and in 2015 was recognized as one of the “40 under 40” by Brand Innovators.